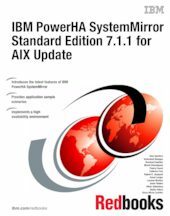 This IBM® Redbooks® publication helps you install, tailor, and configure the new IBM PowerHA® SystemMirror® for AIX® 7.1.1 Standard Edition. This book gives an understanding of the Cluster Aware AIX (CAA). This book helps you design a solution to migrate from the previous version of the IBM PowerHA. This IBM Redbooks publication is targeted toward technical professionals (consultants, technical support staff, IT architects, and IT specialists) responsible for providing continuous availability solutions and support.